Twelve-year-old Shrusti Nerkar is a standard six student in Nashik’s Rachna Vidyalaya. She has invented a shower with special nozzles, which can save up to 80% water. Shrusti’s shower uses approximately 15 liters of water per person when compared to the 80 liters, that is normally used, thereby saving 65 liters of water per shower. 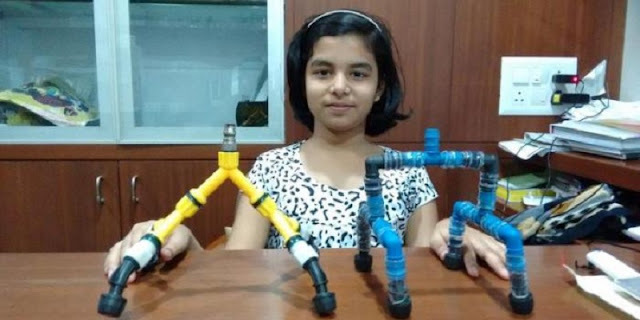 The idea for a smart shower came to Shrusti when she accompanied her father to a car wash. Shrusti told the DNA, “When I went to the car wash and heard them announce that they will wash the car in just two liters of water, I got curious and enquired about how they did it. They were using special sprinklers. Later, I spoke to my father if we could use such sprinklers in our shower.” With support from her father, it took her four failed attempts, before the fifth one finally worked. Shrusti has applied for a patent of her new invention. Her older brother Amey who studies in standard 12 already holds a patent for devising a smart helmet that would not allow one’s scooter to start till it is worn by the rider. Their father, Narendra Nerkar, a professor of electronics at the government polytechnic college, swells with pride at the accomplishments of his children.